While they are indeed Christian, their fight is not primarily for their faith, but for their nation — which is neither Syria nor Kurdistan. In their native tongue—a contemporary descendant of the Aramaic language spoken by Jesus—they call their people Suryoye (Syriacs) and their homeland Bethnahrin (Mesopotamia). Syriacs were among the first to adopt the Christian faith, but their religion and culture gradually became marginalised following the Islamic conquest. Since they lived scattered across the Middle East, most eventually adopted the Arabic language, while a few communities, mainly residing in or near Kurdish-dominated areas, managed to retain their own language. In areas that today form part of Turkey, Syriacs suffered several bouts of persecution leading up to a horrifying climax during the First World War. Although they traditionally obeyed their rulers and kept a low political profile, Syriacs were accused of conspiring with the Christian enemies of the Ottoman Empire. This “problem” found its solution in a genocide that was planned by the Ottoman authorities and carried out in collaboration with local Kurdish Muslims who could benefit by taking over the land and belongings of their victims. Over a quarter of a million Syriacs perished, along with Armenian and Greek Christians and Kurdish Ezidis. Syriacs still refer to 1915 as the “year of the sword”: Seyfo. 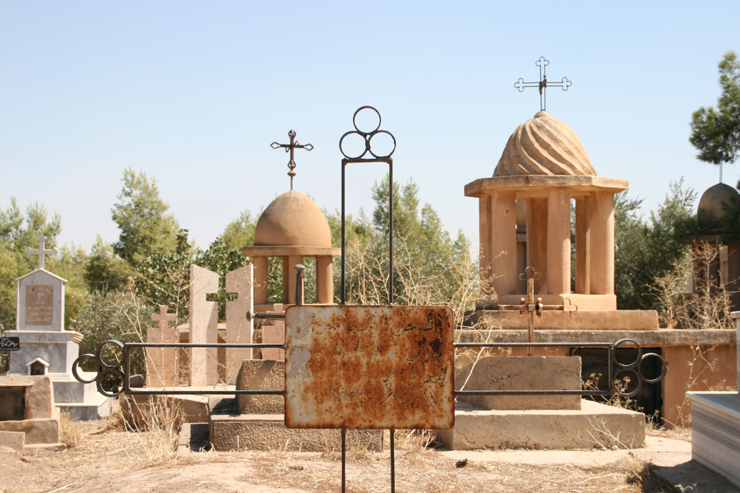 Cemetary by the Syriac Orthodox St. George's Church in the village of Mherka, northeastern Syria. (Photo ©Carl Drott, Sept. 2013). A heavily decimated community managed to remain in the Turabdin area, which after the dissolution of the Ottoman Empire became part of the Republic of Turkey. Others settled instead in the Jazira area—just south of Turabdin—in what became northeastern Syria. This fertile region, previously populated by Arabs, Kurds, and Syriacs, now came to be dominated by the latter—at least for a few years. North of the border, the Turkish government soon turned against the Kurds, who were viewed as a threat to the desired unitary character of the new nation-state. Following the suppression of Kurdish uprisings in the 1920s and 1930s, large numbers of Kurds fled across the border and became the new majority in the Jazira area. For several decades, the Kurds in Turkey offered little resistance to the state’s assimilation policies and oppression. However, political mobilisation took off again in the 1970s, and in 1984 the secular, socialist and nationalist Kurdistan Workers’ Party (PKK) initiated an armed insurgency. The response was brutal and indiscriminate: anyone living in a pro-PKK area could become a target, and standard practices of Turkish security forces included torture, extra-judicial executions, and the destruction of villages. Tens of thousands of Kurds were also recruited to serve as armed “village guards” and while some joined voluntarily, often for opportunistic reasons, many others saw it as the only way to save themselves from government reprisals. Meanwhile, the PKK systematically targeted “local collaborators” and their families. Everyone in southeastern Turkey now had to take sides—for or against the PKK. During this time, there was also an increase in attacks against the Syriacs in Turabdin. Most notably, there was a wave of assassinations without any clearly discernible motive, committed by “unknown perpetrators.” Many suspected that the intention was to drive out the remaining Syriacs, and that the government either was directly involved or had at least turned a blind eye. Since Syriacs constitute both an ethnic and religious minority, nationalist as well as religious extremists presumably desired their exodus, while local opportunists might have sought to take over their property, just like in 1915. Groups belonging to all these categories were at the time operating with impunity in Turkey’s southeast since they agreed to fight the PKK on the government’s behalf. Regardless of who was behind the violence, the presumably desired effect was reached: over the course of the 1980s and 1990s, nearly the entire Syriac community in Turabdin migrated, mainly to European countries like Germany and Sweden. In the late 1980s, a small group of Syriac youth gathered in Midyat, the main town of Turabdin. As they discussed the seemingly hopeless future of their people, they also noted that their predicament was similar to that of the Kurds: they had no recognition as a distinct ethnic group with their own language, and they suffered from discrimination and oppression. However, unlike the Syriacs, who had always played the role of hapless victims, the Kurds were now fighting back. The youth decided to join the PKK’s local support network—but eventually got arrested. Although they were released, they concluded that they could not continue like before—at least not in Turabdin. Paradoxically, since their main goal was to enable Syriacs to remain in their homeland, they chose to follow the migration stream to Europe. 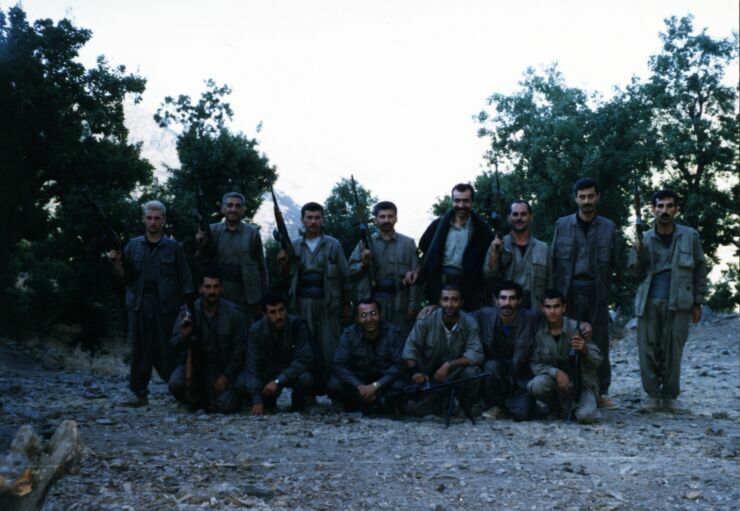 Instead of simply continuing to work for the PKK, the group now established its own secret network, which by 1995 had grown into a disciplined organisation along revolutionary socialist lines. Those who pledged to become party cadres would “leave everything behind” and live only for the struggle. It was hoped that this vanguard would awaken the people and turn into a mass movement. They called themselves Tukoso Dawronoyo Mothonoyo d’Bethnahrin, commonly translated as the Patriotic Revolutionary Organisation of Bethnahrin. Its members referred to themselves simply as Dawronoye, which was first thought to translate as “the revolutionaries”. In fact, the name turned out to mean “the modern” and stuck through later reorganisations as a general label for the movement and its members. As it turned out, many had been waiting for them. In the end, it was a Muslim who took Jacob inside his shop and locked the door, thereby saving him from the mob. Two years later, in 1983, Jacob immigrated to Sweden, where he started working as a language teacher (all children with immigrant backgrounds have the right to “mother tongue tuition” in Swedish schools). He became involved with political work, but found that the diaspora nationalist movement was deeply divided. Since there had been no standardised myth-making process of the kind that united European nation states in the 19th century, different groups had wildly different ideas about the definition, history and character of their nation—or even what it should call itself. The so-called “name dispute” primarily pitted those calling themselves Syriacs against those calling themselves Assyrians, but Jacob never committed to any of these names. For several years, he remained active in organisations on both sides, but eventually lost faith in their ability to attain any tangible political goals. Instead, he started meeting informally with a group of friends to discuss what they could do. “During this time I was always looking for something”, Jacob explains. One day, in a pizzeria owned by one of his friends from the discussion group, his hopes were re-ignited. The year was 1994, and the secret group was Dawronoye. After meeting with one of their representatives, who turned out to be an acquaintance from Turabdin, Jacob was quickly drawn in, and the following year he attended a political training camp where he took the pledge to become a party cadre. By this time, he had left his job as a language teacher and set up a series of restaurants and other businesses, which he now sold in order to devote himself full time to the struggle. After a stint as a grassroots political organiser in the Netherlands and Germany, Jacob would move on to media work and travel extensively to Iraq, Syria, Lebanon, and Iran. Sargon was born in 1972, and moved from Turkey to Sweden with his family at the age of four. As he grew up, he experienced friction between the lifestyle and values of his traditional family home and the surrounding society. “We who were brought up in the 1970s and 80s suffered more or less from an identity crisis, and with that came an inferiority complex and everything, and then you tried to show yourself off as someone you are not”, Sargon explains. In his mid-teens, he started drinking, using drugs and acting out, and although he had a talent for studies, his absences ultimately got him expelled from upper secondary school, and he started working odd jobs. He also became involved in a local Assyrian youth group and spent a lot of time reading about the history of his people. However, the rival historical narratives presented by different political factions added further to his identity crisis. “Are we Syriacs? Assyrians? Arameans? What the hell are we?”, he asked himself. Sargon Adam (left) and his comrade Midyat in the mountains. (Photo courtesy: Sargon Adam, July 1999). Dawronoye’s goal was not only to attain national rights, but also to bring about wider social, political and cultural change. Many of Dawronoye’s activities in Europe centred around the Seyfo issue. The government in Turkey denied that any genocide had occurred in 1915, and Syriacs there had always exercised self-censorship on the topic. “All Suryoye knew about Seyfo, and you would talk about it at home, but you did not dare say anything outwardly”, Jacob says. Even in Europe, the genocide of the Syriacs—unlike that of the Armenians—was unknown to most people and unrecognised by all governments. Dawronoye now tried to raise their voice through street protests, hunger strikes, and house occupations, where they demanded one simple thing: recognition of Seyfo. There was another issue, however, in which Dawronoye refused to take a stand. “The name dispute had torn us apart and emptied all of our strength”, Sargon says. “Our goal was to enlighten the people that they are one and the same people, with the same roots, homeland, everything.” In their events, they held both Syriac and Assyrian flags, and tried to circumvent the name dispute by rallying around the less contentious name of their homeland: Bethnahrin. As they set up their new movement, Dawronoye were coached by the far more experienced revolutionaries of the PKK—something that was bound to spark opposition within the Syriac community where anti-Kurdish sentiments ran deep. These sentiments were based on more than historical grievances; the same attitudes towards Christians that had enabled Kurdish participation in Seyfo could still be found among tribal and conservative Kurds. 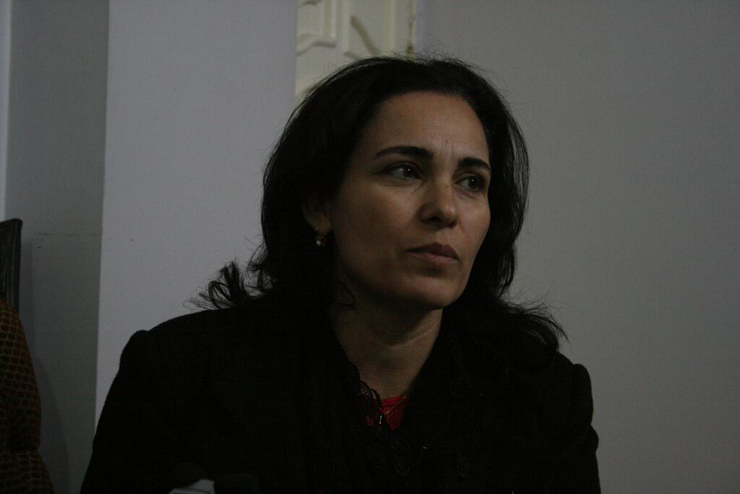 However, Dawronoye argued that the PKK represented a clear break with the past, since they supported the same rights for others as they wanted for themselves, and actively worked to change norms and structures within their own community. “That party will cooperate regardless of what people you belong to, because they are fighting against the oppression that comes from the same direction against all the groups there”, Jacob explains. Many took it for granted that Dawronoye simply constituted the Syriac wing of the PKK. “The truth is we have always made our own decisions, but certainly we have learned from the PKK, and they have helped us a good deal”, Sargon says. While Europe became a stage for political activities, and Syriacs there provided crucial funding, Dawronoye had from the start aimed to return to Bethnahrin. To show the world that they were no longer willing to submit, members were going to establish an armed wing and fight the Turkish state. However, southeastern Turkey had a far too high presence of security forces and informants, so in 1995 the first group of cadres instead travelled to Syria, and from there crossed over into Iraq. The conditions in northern Iraq may have been favourable, but they were also very complicated. The Kurds, who form the vast majority of the population here, had risen up against Saddam Hussein’s oppressive government in the wake of the 1990-91 Gulf War, expecting support from the United States and its allies. As the government moved in to crush the uprising, US and allied forces finally intervened to establish the world’s first “no-fly zone”— which effectively became a “no-go zone” for government forces. The Kurdistan region now gained de facto autonomy, and when largely free and fair elections were held the following year, it seemed like a promising sign. However, the results produced a draw between Jalal Talabani’s Patriotic Union of Kurdistan (PUK) and Massoud Barzani’s Kurdistan Democratic Party (KDP). A “fifty-fifty” power-sharing arrangement failed to bring about a functional government, and tensions between the two rivals finally came to a head in 1994, when civil war broke out. During the conflict, the PUK allied itself with the PKK and Iran, while the KDP developed a close cooperation with Turkey—which also sent its own troops across the border to hunt down the PKK. Although the PUK-KDP conflict ended in 1998, the war against the PKK continued. Dawronoye first established itself in the Badinan area, which lies on the Turkish border and has a sizeable Syriac population. However, this is also KDP heartland, and despite Dawronoye’s declaration of neutrality in the intra-Kurdish conflicts, the group was soon forced to leave for the Qandil mountains. Here, fighters set up a separate camp in the close vicinity of a major PKK base, where they could receive military training, and from 1996 onwards they fought alongside their mentors. 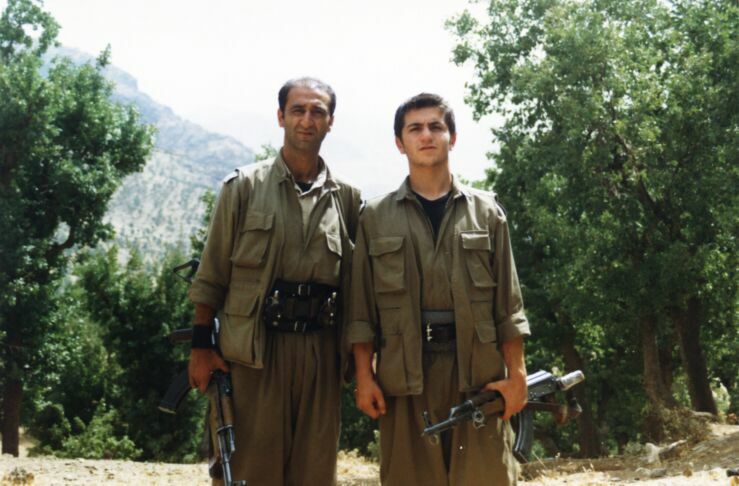 Dawronoye’s guerrillas were so few, and at least initially so inexperienced, that they never launched any operations on their own, but instead rotated for duty in a small unit that was integrated into the armed wing of the PKK. “There was fighting maybe every week or every other week, where the unit took part. We had at least four or five comrades all the time in the fighting”, says Sargon, who joined the guerrillas in May 1999—only a few months before a unilateral PKK ceasefire brought an end to Dawronoye’s war. In 2000, Dawronoye held its first congress, and members reorganised as the Bethnahrin Freedom Party (Gabo d’Hirutho d’Bethnahrin, or GHB). Sargon criticised the new party’s vague political vision and lack of concrete goals, and when he refused to back down he was imprisoned in the mountain camp. “I had to accept what the congress had decided, and unconditionally follow the party,” says Sargon, who after several weeks buckled and went back to his duties. The congress also saw the first cracks emerge in the relation between Dawronoye and the PKK, whose representatives were not invited; although their cooperation continued, the PKK henceforth viewed its Syriac allies with open suspicion. 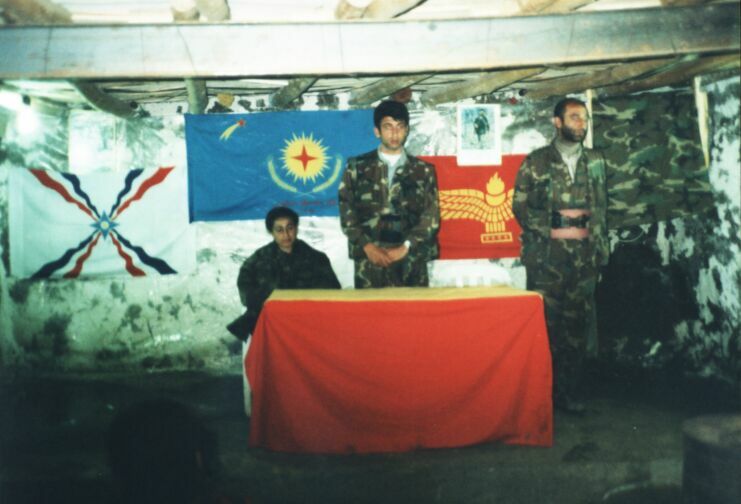 A meeting conducted shortly before Dawronoye's guerrillas engaged in military operations alongside Kurdish forces. In the background hang Assyrian, GHB and Syriac flags. (Photo courtesy Sargon Adam, March 2003). After Dawronoye were forced out from the Badinan area, they had tried to mobilise the small Syriac communities in the PUK zone, but with little success. “The people in those areas had started calling themselves 'Christian Kurds'. They had no concept of an own identity”, Sargon explains. Dawronoye instead turned their focus to the larger Syriac communities residing in Mosul and on the Nineveh plains, outside of the no-fly zone. Since they shared common enemies, Saddam Hussein’s government tolerated a limited presence of PKK cadres in the nearby Makhmour refugee camp, and they would now provide cover for Dawronoye. “I could move around in the Mosul area, but had to be very alert, because the Mukhabarat [the intelligence service] was extremely good at detecting people who behaved in an odd way”, says Sargon, who arrived in Makhmour in the autumn of 2001 and remained for about a year. Dawronoye nevertheless managed to attract scores of new party cadres from various locations, and over time its armed wing grew to include around 150 guerrillas. While a core group of around 35 originated from Turkey and had lived in Europe, the rest were local recruits. However, they rarely developed the “revolutionary character” that was expected. When the US invasion arrived in the spring of 2003, Dawronoye joined the Kurdish offensive from the north, hoping to assert itself as a political force in the newly liberated areas. “Together with the PUK, we went into Kirkuk and took some offices belonging to the Baath party”, Sargon recounts. The Iraqi army had fled before they even arrived, and soon thereafter Dawronoye decided to demobilise their armed wing and end their cooperation with the PKK. “We thought new politics would begin in the Middle East, and that we would be able to fight for our rights in a political way. This is why we laid down our weapons”, explains Jacob, who left the PKK-affiliated Medya TV to set up Dawronoye’s own Suroyo TV. While Dawronoye failed to establish any real foothold in post-invasion Iraqi politics, another arena opened up around the same time, as Turkey appeared to be edging closer to EU membership. In order to lobby the EU and its member states in relation to the accession talks, Dawronoye founded the European Syriac Union (Huyodo Suroyo d’Urifi or ESU) in 2004—but the new organisation’s more polished and diplomatic approach, along with the sudden adoption of the term “Syriac”, proved controversial internally. “They changed strategy without any congress or anything. Why should we call ourselves 'Syriacs' and who decided this?”, Sargon asked. He was promptly imprisoned once again. “Turkey wanted to take us under its control, and we wanted to test how Turkey reacts.” For Sargon, however, this was no victory, but the final proof that Dawronoye had abandoned their ideals and ended the struggle prematurely, without securing any meaningful political concessions. “You can sit with your enemy or your oppressor, but there should not just be peace for one side, while the other gets nothing”, he argues. “Okay, maybe some in the Dawronoye movement can travel to Turkey without getting arrested, but what have you gained on that as a people? Nothing.” After nine years as a full-time party cadre, six of which were spent in Iraq, Sargon finally cut all ties with Dawronoye and returned to Sweden. Dawronoye had maintained a presence in Syria from the very beginning, primarily in the Jazira area, and although the regime's intelligence agencies occasionally clamped down on the movement, they mostly stuck to monitoring its activities through regular meetings. Open agitation against the government was clearly a red line, but cultural activities as well as political work relating to Turkey and Iraq would generally be tolerated. This arrangement came to an abrupt end in the spring of 2012, as Dawronoye’s Syrian affiliate, the Syriac Union Party (Gabo d’Huyodo Suryoyo or SUP), used the Akitu celebrations as an opportunity to declare its opposition to the regime of Bashar al-Assad. A few days later, several activists were arrested in early morning raids, and more were picked up when a demonstration organised in response was violently disbanded. However, although several were tortured, they were ultimately released. Apparently, regime security forces exercised more restraint here than in other parts of the country, so as not to jeopardise existing local support, but they would soon lose territorial control anyway. A few months later, the People’s Protection Units (YPG) took control of a large part of the Jazira area and the government withdrew to a few isolated enclaves. While the YPG stood under the control of the Democratic Union Party (PYD), which cautiously tried to forge a third way between the government and the rebels, activists from the SUP pushed their way into the Syrian embassy in Stockholm, issuing a press release condemning “the terrorist regime of Al-Assad” and hailing ”the martyrs of the Syrian Revolution.” Despite such defiant declarations, Dawronoye could accomplish precious little on its own, and there were few “moderate rebels” in the area—only a growing threat from jihadist and criminal groups. However, since the PYD is the Syrian branch of the PKK movement, the solution appeared natural. Dawronoye would get back together with its former allies and take up arms again. he MFS initially hinted at future military action against the regime, but this never materialised. Instead, a more immediate and existential threat appeared, as a coalition of rebel and jihadist groups suddenly attacked. The MFS and the YPG soon fought side-by-side in the frontlines to defend the area, while Sutoro developed an increasingly close cooperation with its Kurdish counterpart Asayish. Just like in the 1990s, Dawronoye integrated into the security structures of their Kurdish allies, while retaining their own organisations and financing themselves through diaspora donations. 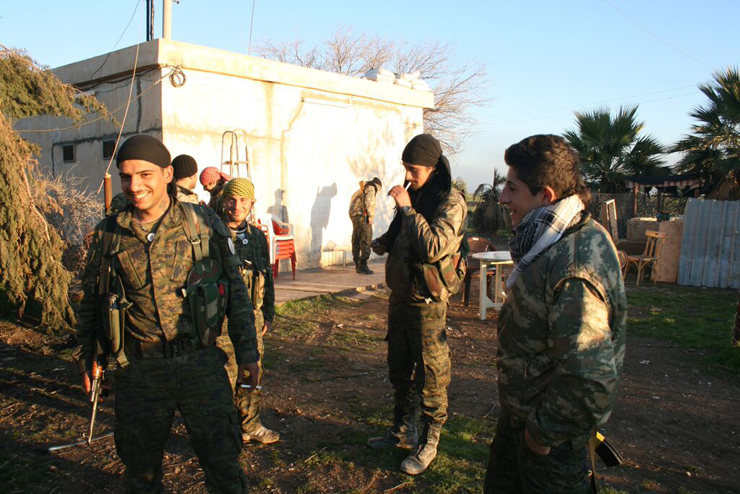 MFS fighters outside their base in Ghardukah, northeastern Syria. (Photo ©Carl Drott, January 2014). Around the same time as the attacks began, the PYD invited other parties and civil society organisations to participate in a process to form local governance structures. Most turned down the offer, fearing that the PYD would continue to dominate, but the SUP participated actively from the beginning until the end. Among the chief declared goals was one to ensure the peaceful coexistence of different ethnic and religious communities. With unmistaken symbolism, one of the first meetings was conducted across the border in Midyat, where Kurdish representatives took the opportunity to apologise for their people’s role in Seyfo. When the autonomous “Jazira canton” was declared in January 2014, representatives of the SUP took up positions in the government and legislative assembly, while Syriac, Arabic, and Kurdish were declared official languages. Nazira Goriye, co-spokesperson of the legislative assemply in the autonomous Jazira canton. (Photo ©Carl Drott, January 2014). Over the years, Dawronoye learned to adapt to a rapidly shifting political environment, and several times changed its strategy to exploit opportunities wherever they emerged. More often than not, the group has seen its ambitions frustrated—not surprisingly, considering that it has always tried to punch above its weight. Perhaps Dawronoye's activists have now finally found their chance. Dawronoye’s core goal is to ensure the future existence of its people in their native lands, but with the possible exception of the Nineveh plains in Iraq, there is no place where they could realistically seek regional autonomy, let alone their own state. In other words, they have to find a way to live with the majority population without being dominated by it. Meanwhile, the PKK movement has come to embrace a vision of a multicultural mosaic within a decentralised democratic system. While sharing some overarching political structures, different communities should be encouraged to organise their own grassroots-level structures, and manage their own affairs to the greatest extent possible. In other words, the respective projects of Dawronoye and the PKK coincide perfectly in Syria. So, what are the chances that Dawronoye can garner popular support for its project? After all, these secular, nationalist revolutionaries represent a complete inversion of their community’s tendency to remain politically passive and subservient while turning to religion for consolation. Unlike the PKK, Dawronoye have yet not succeeded in building a mass movement—but the necessary infrastructure is in place, in the form of a network of affiliated civil society organisations. Furthermore, the lawless situation in Syria plays to their strengths. Like the PKK, Dawronoye are well organised and good at getting things done, and their cadres are motivated by ideology rather than material incentives. Perhaps most importantly, they are now the ones holding arms to defend the area. In a situation where the Islamic State is directly threatening the very survival of the Syriac people, Dawronoye and their Kurdish allies are fighting and dying in the frontlines to protect them, asking for nothing in return—except the opportunity to shape tomorrow’s society.